Brethren: Put ye on therefore, as the elect of God, holy, and beloved, the bowels of mercy, benignity, humility, modesty, patience:  Bearing with one another, and forgiving one another, if any have a complaint against another: even as the Lord hath forgiven you, so do you also. But above all these things have charity, which is the bond of perfection:  And let the peace of Christ rejoice in your hearts, wherein also you are called in one body: and be ye thankful. Let the word of Christ dwell in you abundantly, in all wisdom: teaching and admonishing one another in psalms, hymns, and spiritual canticles, singing in grace in your hearts to God. All whatsoever you do in word or in work, do all in the name of the Lord Jesus Christ, giving thanks to God and the Father by him. Wives, be subject to your husbands, as it behoveth in the Lord. Husbands, love your wives, and be not bitter towards them. Children, obey your parents in all things: for this is well pleasing to the Lord. Fathers, provoke not your children to indignation, lest they be discouraged. At that time, when Jesus was twelve years old, they, going up to Jerusalem according to the custom of the feast, and having fulfilled the days, when they returned, the Child Jesus remained in Jerusalem, and His parents knew it not. And thinking that He was in the company, they came a day's journey, and sought Him among His kinsfolk and acquaintances. And not finding Him, they returned to Jerusalem, seeking Him. And it came to pass that after three days they found Him in the Temple, sitting in the midst of the doctors, hearing them and asking them questions. And all that heard Him were astonished at His wisdom and His answers. And seeing Him they wondered. And His mother said to Him, "Son, why hast Thou done so to us? Behold, Thy father and I have sought Thee sorrowing." And He said to them, "How is it that you sought Me? Didst you not know that I must be about My Father's business? And they understood not the word that He spoke to them. And His mother kept all these words in her heart. And Jesus advanced in wisdom and age and grace with God and men. 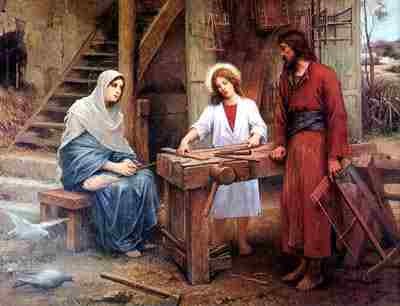 Today's feast of the Holy Family is relatively new as things go in the Catholic Church, having been instituted about a 100 years ago by the saintly Pope Leo XIII. At first it was a local feast, observed only in some areas, but in the early part of this century, under Pope Benedict XV, it became part of the calendar of the entire Catholic Church. While fostering devotion to Jesus, Mary, and Joseph is certainly an object of this feast, it was instituted with the more practical purpose of reminding all of us about the importance of family life. The family is, after all, the essential unit of society, so all of mankind has a stake in the health of the family as an institution. The popes, of course, were reacting to trends that had been in progress for years if not centuries. Society was becoming more and more urbanized, with families depending on wage labor, finding themselves in cramped housing, and having to purchase (rather than raise) all of the necessities of life. Demographers further predicted the imminent overcrowding of the earth along with un breathable air, rivers of sludge, and oceans filled with dead fish. False philosophies abounded, claiming God to be a myth and urging people to build their paradises here on earth. Individualism took on new proportions, erecting new social and legal barriers between husbands and wives, and between parents and children. Then too, there were social evils that would have probably escaped the wildest imagination of men in the time of Leo XIII. In his day polite people didn't even discuss things like birth control, abortion, or sexual perversity. Perhaps the more liberal elements in society called for laws permitting divorce under rather extreme circumstances, but virtually everyone recognized the desirability of marital fidelity and the stable family. Euthanasia or “mercy” killing was largely a concept reserved for works of fiction. A hundred years later, all of these unexpected evils have come to pass. Modern day Christians can look at the world around them, and their “wildest imagination” is inadequate to suggest many more ways in which family life can deteriorate. Maybe it is just shortness of sight, but it is hard to imagine any new crimes we can commit against family life. But, of course, more of the same might be as bad or worse than any new sins we might invent. A common denominator in these sins against family life seems to be personal pleasure and convenience. Not surprisingly, most everyone wants to enjoy life more, and expend less effort to do so. And very often the damage done by sins against family life is not immediately apparent. The “unborn children that might have been” raise no voice. The suffering oldster is not only “out of his misery,” but also out of sight, and out of mind. Through fiction of law, the marriages of those who are angry or just plain bored with each other are banished from the public memory. Such sins have become so commonplace and socially acceptable that few of us are without some guilt in these matters. But sin is very rarely (if ever) without a price. Thirty or forty years ago, school principals worried about kids throwing spit balls, sticking gum under the desks, and smoking in the bathroom. Today their concerns have more to do with guns, and drugs, and suicides, and pregnant students. And doesn't the daily news reflect a rise in husbands and wives beating and killing one another—there may be better reporting, but we all know that's not the entirety of it. We've even gotten to the point that every time a child is reported missing, the mother and father are thought to be the prime suspects. But what are we to expect? In much of our society, husband and wife are not married to each other in any meaningful sense of that term (if at all). The victim child is often hers but not his (or vis-versa). The word “family” is often just a polite term to describe an unholy relationship. So it was for all of these reasons—and certainly not excluding devotion to Jesus, Mary, and Joseph—that our holy popes gave us this feast of the Holy Family. As a family they are given to us as a model to imitate: A loving relationship of parents and child; a permanent union, broken only by death; a union informed with chastity and charity, hard work, loyalty, and devotion; a union in which the God man Himself was subject to a man and a woman, because such obedience is in the natural order of family life. “Mercy, kindness, humility, meekness, patience ... forgive one another ... have a constant mutual charity.” Paul was writing to the Christians in the Greek town of Colossæ, but his words certainly describe the relationship of Jesus, Mary, and Joseph. Perhaps, then, whenever we are tempted to fall down in our own obligations as family members, we will call upon this Holy Family in prayer and make them the object of our imitation. Finally, let me close by reminding you that we are all members of society—a society going in a radically wrong direction. And to the degree that we can exercise influence in that society, politically, or through practical good example, we ought to do so. Sins against the family are costly indeed; measured most often in human lives and human souls. Jesus, Mary, and Joseph pray for us.